VW Beetle Street-Legal Jet Powered – takes jet engine to our streets! VW Beetle is a modern symbol of people car built after the war for ordinary folks; having great price, air-cooled boxer with 4 cylinders and individual sound. This car survived many decades and it was still produced in Mexico few years ago. More than 50 years of production means the title of one of the longest production in the history. It became one of the most popular cars with strong image and cultish design. So Volkswagen decided to build its successor. After more than 50 years from the time of introduction, a new model was born. Its name „New Beetle“ reveals that we can see a new member of VW family. But unfortunately it’s not the same car – interesting with great price. Also the engine isn’t at the back and it has no great sound of boxer. Instead of the classic concept there’s a boring engine with FWD. You can choose from 5 4-cylinders and one V5 engine. There are also diesel variants. But its design is something different and has something from the legacy of its older brother. But honestly, everybody waited something more from the successor of the legend. But tuning companies didn’t hesitate and now they offer everything you can imagine for the exterior or interior, engine too. There’s a lot to choose and practically you can built your own Beetle too. But what happens when an engineer with PhD title from Stanford wants to make some improvements? A revolution in tuning. We present you a breath-taking VW Beetle Jet Powered. Yes, you’re right – jet means jet engine. 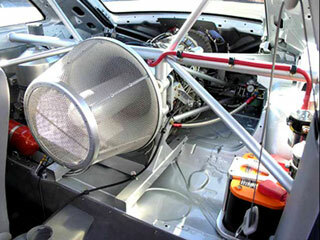 So our engineers installed a jet engine from a helicopter to this three-door car without removing its original engine. As he said, he wanted to build a jet powered car suitable for traffic. He removed rear seats and installed a General Electric Model T58-8F jet engine producing 1.350hp at 26.000rpm. Of course this engine is so big that the car is now about 150cm longer. So the car has now a big opening for jet. But you need also count with next 2-3 meters for flames? It’s not possible to turn on the jet whenever you want. You can turn it on only when you’re moving, because the engine is so powerful that it should fly away from through the front window the stopped car. It’s creator couldn’t tell us the jet car’s top speed, because it was tested only on a closed runway and it couldn’t reach its possible top speed due its insufficient length. But the creator confesses that he didn’t build this car for suicide but for fun. But he’s ready to lend the car to brave volunteers. 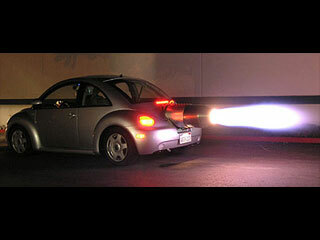 The Street-Legal Jet powered VW Beetle was built to be used in everyday traffic, but with the highest possible performance not allowed in the streets. Something unusual and fantastic. But the result meets all ideas of the concept. What do you think about this legal rocket on four wheels?